Sáez L., Rita J., Bibiloni G., Roquet C. & López Alvarado J., 2011. 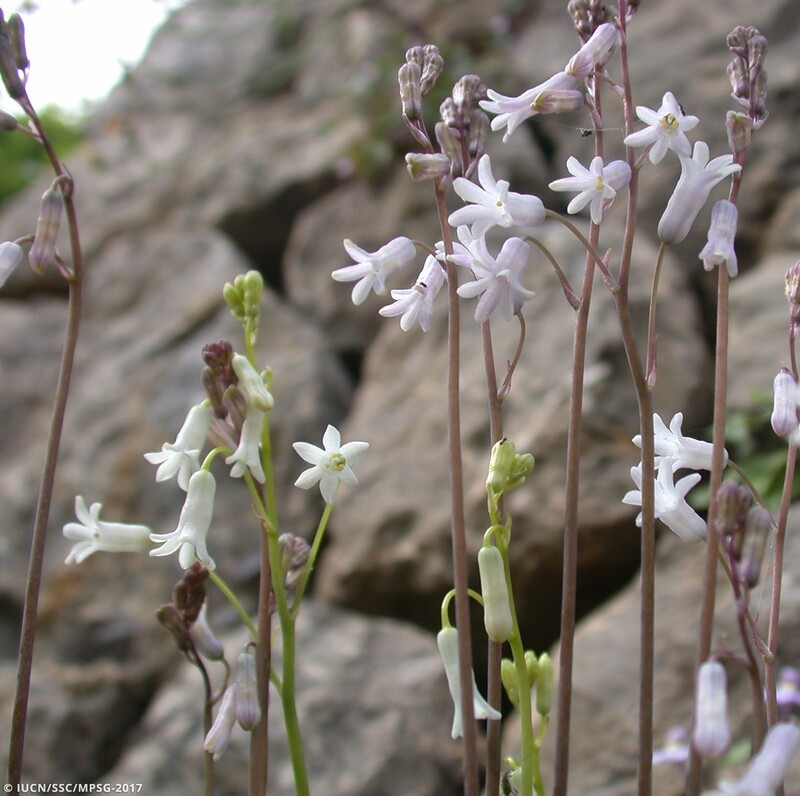 Systematics of the narrow endemic species Brimeura duvigneaudii (Hyacinthaceae). Orsis, 25: 55-69. This plant is small and inconspicuous, not exceeding 15 cm in height (although subsp. occultata has flowering stems that reach 28 cm in height). Its grass-like, ribbed, linear leaves are about 3 mm wide and triangular in cross-section. The one-sided inflorescences are composed of two to seven (rarely eleven, and up to 14 in subsp. occultata) flowers with white or pink corollas (never blue like those of its close relative B. amethystina). 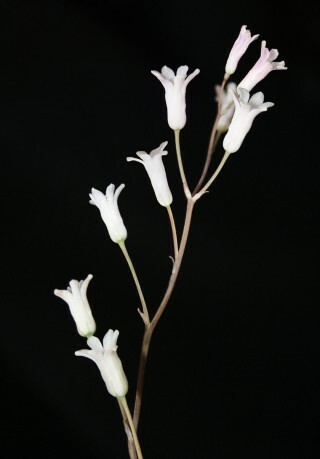 The best criterium to distinguish this species from the closely related B. fastigiata is the length of the flower lobes, which in B. duvigneaudii are shorter than the flower tube. Its biology is poorly known. The above-ground parts of the plant die back in summer so that the plant overcomes the hottest and driest season as a bulb. Only one population has so far been observed producing seeds; all others seem to reproduce only asexually through bulb propagation. Brimeura duvigneaudii subsp. duvigneaudii has been categorized VU (Vulnerable) according to IUCN Red List Criteria D2. 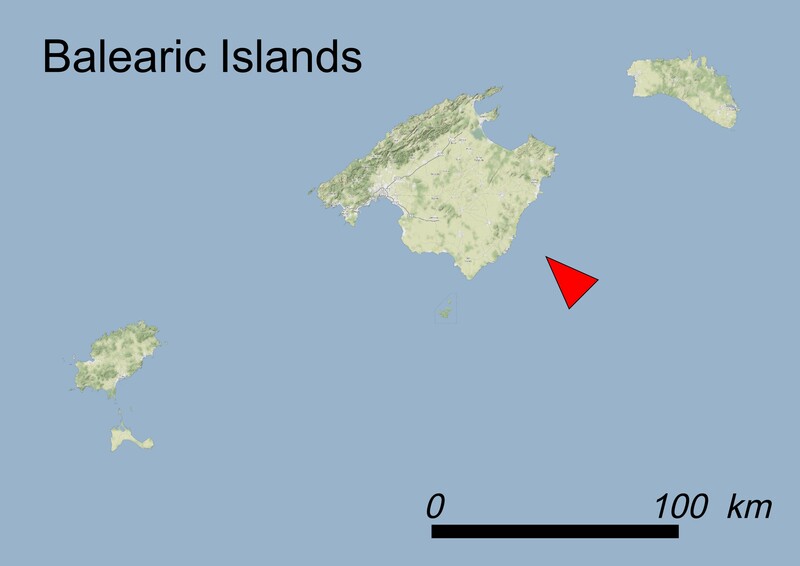 Using a grid of 1×1 km, this taxon has an EOO of 19.5 km² and an AOO of 9 km². No data are available on the amount of mature individuals, hence the current demographic trends of the population are unknown, although recruitment seems to be low. There is also evidence that this plant may have disappeared in one locality. The main threat is represented by grazing pressure due to wild goats (threat 2.3.2: Small-holder grazing, ranching or farming). This subspecies is vulnerable also to extreme natural events, such as fires started by shepherds to feed their flocks (threat 7.1.1: Fire and fire suppression - Increase in fire frequency/intensity) and drought (threat 11.2: Droughts). Further research is needed and if a decline is noted, this species could be upgraded to ‘Endangered’ or ‘Critically Endangered’ under Criteria B1 and B2. The subsp. occultata has been categorized as CR (Critically Endangered) according to IUCN Red List Criteria B1ab(iii)+2ab(iii); D. This means that it only occurs in a single locality and that its population is small, declining, with an estimation of no more than 50 mature individuals. Sport activities such as canyoning (threat 6.1: Recreational activities) nowadays attract large numbers of visitors and threaten to overwhelm the carrying capacity of this fragile ecosystem. Some plants are also removed by collectors (threat 5.2.1: Gathering terrestrial plants - Intentional use). Legally: the populations of both subspecies fall within the protected areas ES5310027, “Cimals de la Serra" (subsp. occultata) and “ES5310127 “Costa Brava de Tramuntana” (subsp. 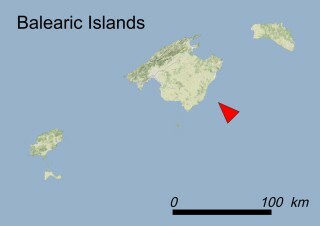 duvigneaudii), which also correspond to Natura 2000 sites. 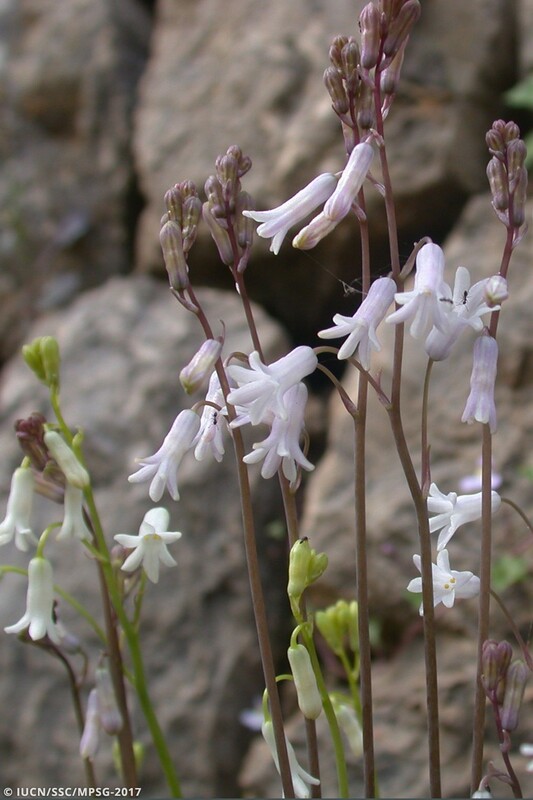 B. duvigneaudii is listed as a species sensitive to habitat changes in the catalogue of threatened species of the Balearic Islands (Decree 75/2007). In situ: No special measures have been taken yet. Ex situ: This species has been cultivated at the Botanical Garden of Sóller (Majorca, Spain), where seeds are also being stored. It is necessary to reduce and control the population of goats to allow population growth. Moreover, it is necessary to undertake careful field investigations to look for other populations of both subspecies, which may easily be overlooked due to their minute size. A substantial increase in monitoring activities is needed to understand the population dynamics and the reproductive behaviour of both taxa. Arson should be reduced by better controlling local pastoral activities. Dr. Llorenç Sáez, Autonomous University of Barcelona. Dra. Eva Moragues, Government of the Balearic Islands. Xavier Manzano, Conselleria de Medi Ambient, Agricultura i Pesca, Govern Balear.